Are you confident that you would be able to defend yourself if the person walking behind you had ill intentions and attacked you? Would you be afraid? Or would you, having just achieved your next belt rank in Aikido, know exactly how to prevent the attack, make it to your car safely and have a crazy story to tell the family when you got home? Self defense equals self confidence. Your Aikido training will have you walking through that parking lot with no doubt that you would be able to take care of yourself. We’re not just talking to the ladies… although we have found that it is women who are drawn to the idea of being able to defend themselves since it is typically women who are preyed upon. But that doesn’t leave out you men. Imagine being confident in your ability to protect not just yourself but your loved ones should a they be attacked or victimized. 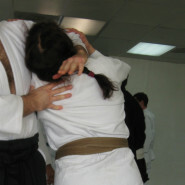 Get your Aikido on at Aikido of Escondido!